A little fun on the side. Violent multiplayer battles with parkour interludes and mechs armed to the teeth? 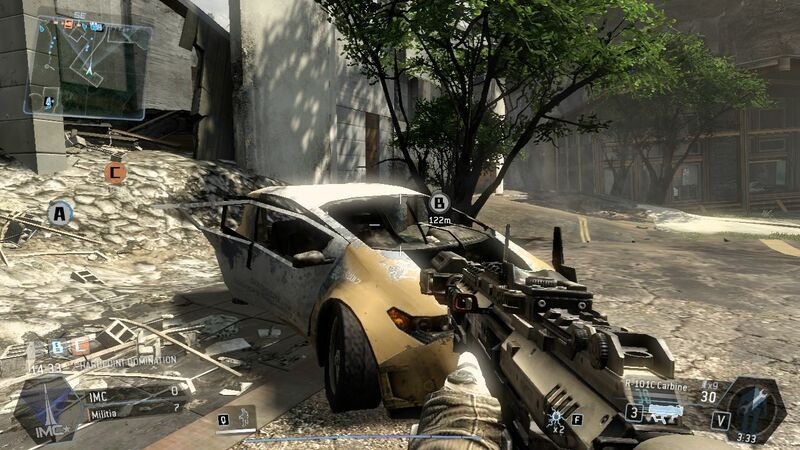 That is how the former Call of Duty developers envision the future of the action genre. We took a closer look at the graphics demands; so read on to find out which graphics card you will need. 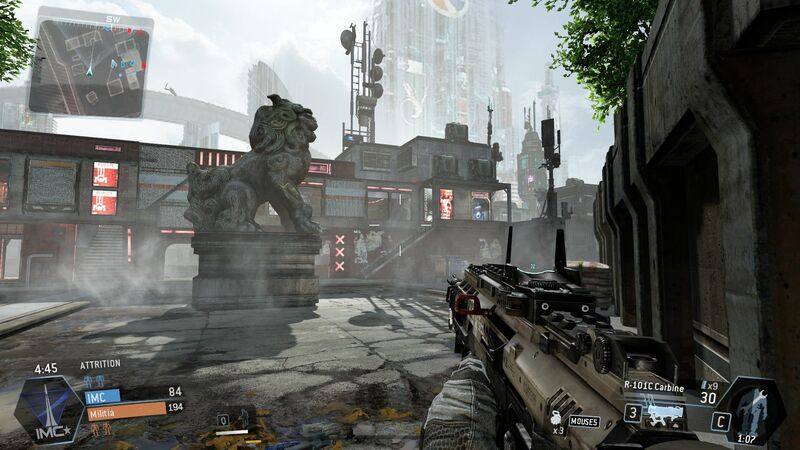 Passionate gamers waiting for a graphics bomb in the style of Battlefield 4 or Crysis 3 will not find what they are looking for in Titanfall. 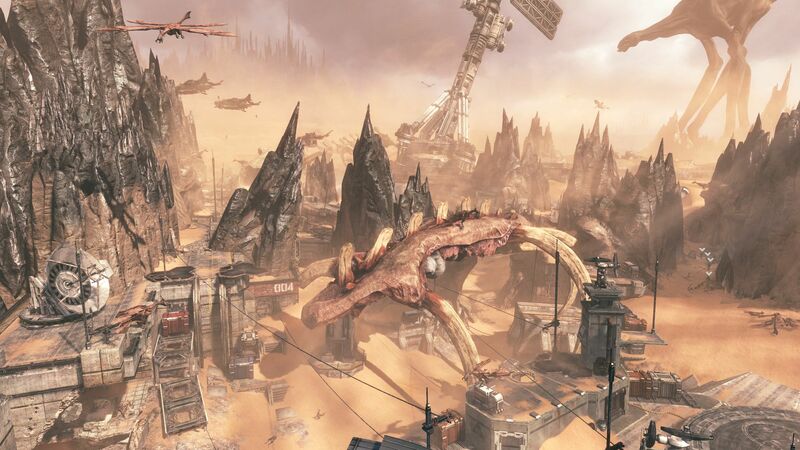 The source engine has been massively revamped in recent years and embellished with new features, but the graphics technology is still not really modern. For one thing, the texture quality does not meet 2014 standards: Most of the object wallpapers are too sludgy upon closer inspection. 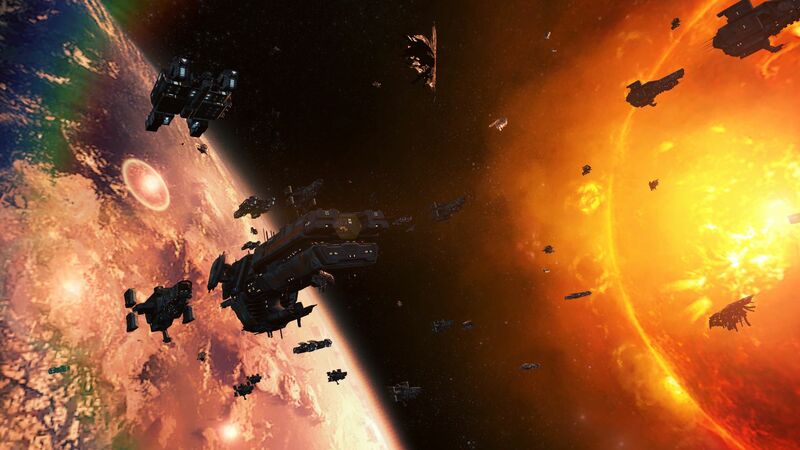 Another shortcoming is the lack of a detailed physics and destruction system. Yes, in some scenes the screen is bursting with effects and explosions, but you will not see any crumbling walls or collapsing houses. 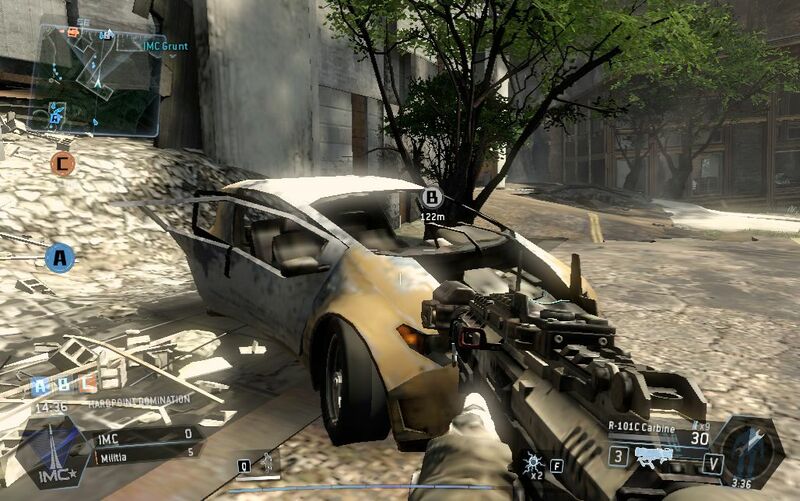 Considering this, it is even more surprising to us that Titanfall takes up 50 GB worth of hard drive space. 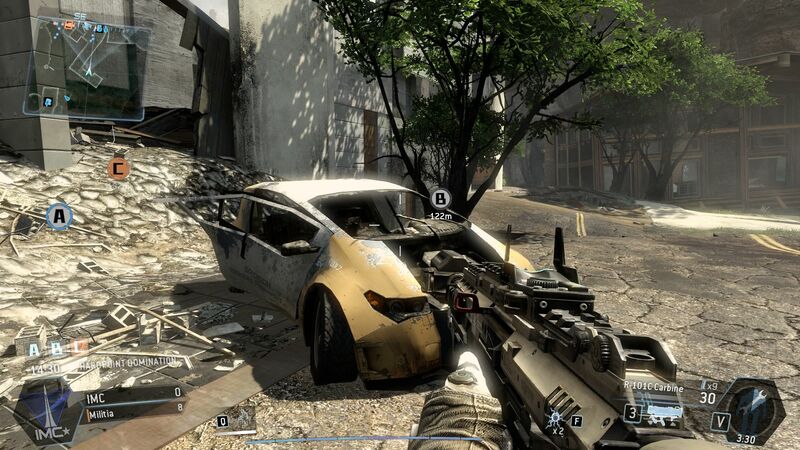 Even Battlefield 4 only occupies about 25 GB at the moment (Crysis 3: ~14 GB). 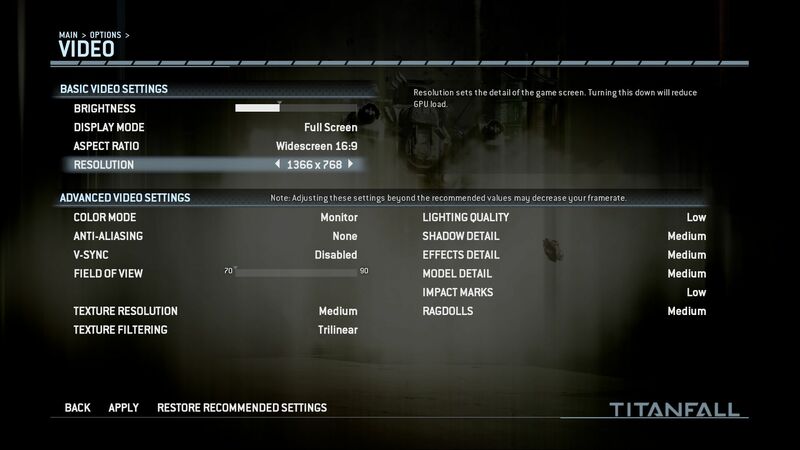 However, we do want to praise the developers for the easy-to-use, well-designed menus, though some of the graphics settings can only be altered in the main menu, not during a running match. That includes the resolution and texture quality. Speaking of textures: Because the maximum setting, "Insane," screams for a graphics card with at least 3 GB of VRAM, we chose not to use this level in our benchmarks and just stuck with Low, Medium, High and Very High. Besides texture quality, the video menu offers a number of other options. Be it light, shadow, effect and model details, or bullet holes, or ragdoll physics, they are all there. The brightness, picture mode, aspect ratio and field of vision can be adjusted as well. Thanks to the integrated anti-aliasing and anisotropic filtering, far-away objects still appear relatively sharp and without jagged edges. 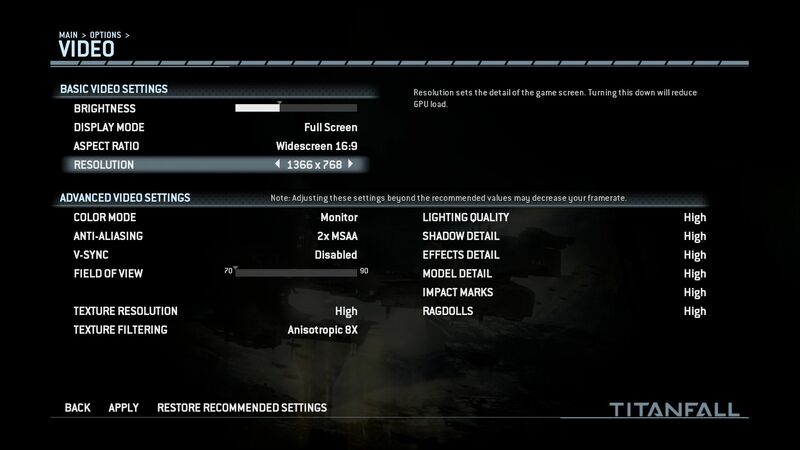 V-Sync, which prevents bothersome screen tearing, was deactivated for our benchmarks. Unfortunately, the maximum refresh rate aligns with the frequency of the monitor. 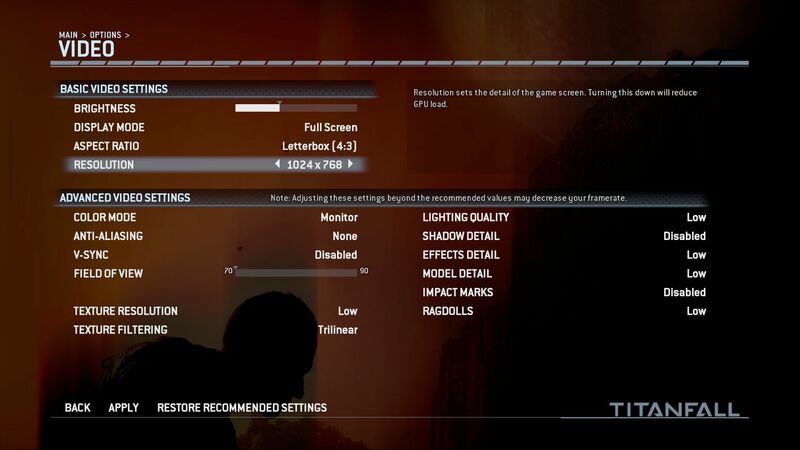 While 120 Hz panels cannot display more than 120 frames per second, an ordinary 60 Hz monitor, like you find in more devices, will not exceed 60 fps. It may not be the best etiquette, but due to this issue we only tested our graphics cards in each setting if they did not hit this limit. For example, if model xy reached 59 fps on the High setting, we simply recorded 60 fps for Medium and Low. 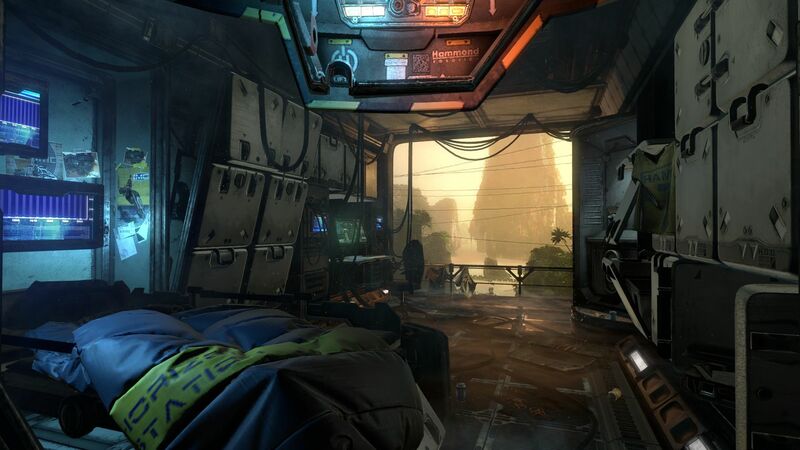 In terms of the feel of the game, Titanfall is quite enjoyable. Despite some deficits in atmosphere due to the antiquated graphics technology, the roaring battles are staged in a way that is stylish and thrilling. The fast game tempo paired with the uncomplicated controls and fresh gameplay ideas make for a very fun experience. At least for a few hours, anyway -- after a while the mechanics will get a little monotonous, whether or not there are new upgrades and improvements. Whether you will be motivated to keep playing Titanfall for an extended period of time depends very much on your personal preferences. 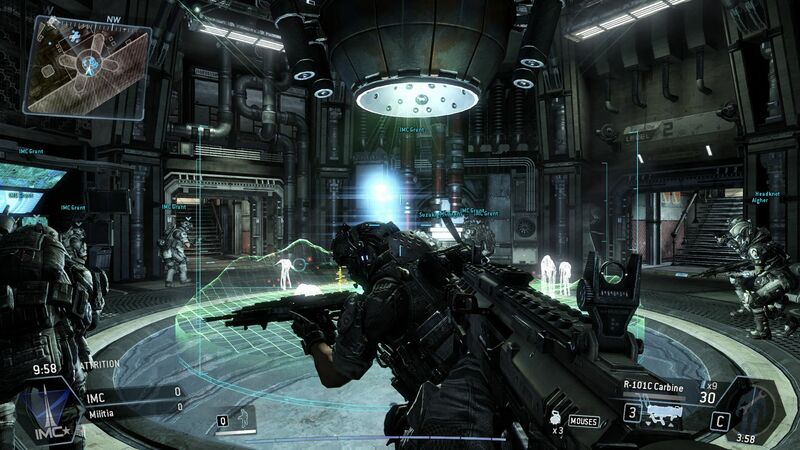 In the end, like with most multiplayer games, you just find yourself fighting your way through masses of opponents. 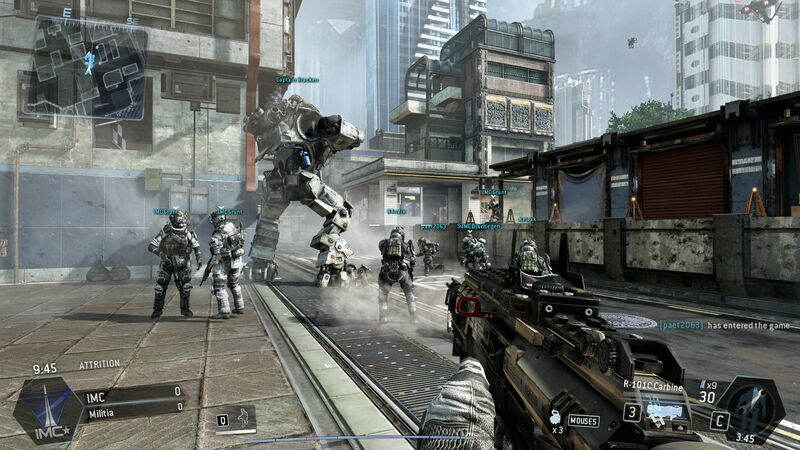 But as an uncompromising action-shooter game to play every now and then, Titanfall is exactly what it should be. The fluid and very comfortable controls and the crisp sounds are huge contributors here. Multiplayer titles that do not have an offline mode are not particularly suited for benchmark testing. Because the title flows differently each time you play, and other factors influence the game as well (server quality, ping, etc. ), there is a lot of unavoidable fluctuation. The task of finding a graphically demanding scene that is as comfortable as possible to benchmark AND offers consistent results is a hard one indeed. Although the tracking shots at the beginning of the campaign levels are not the perfect solution to our problem, we decided to use the start of "The Refueling Raid" mission (on the IMC side). As long as our character, directly upon exiting the helicopter, is sitting or standing with his gaze overlooking the battlefield (which is true in about two-thirds of our passes), the results do not differ massively. Only if the character is positioned at a wide angle, and the environment is no longer visible, does the performance sometimes increase. In such cases, we moved our head in the direction of the "action." 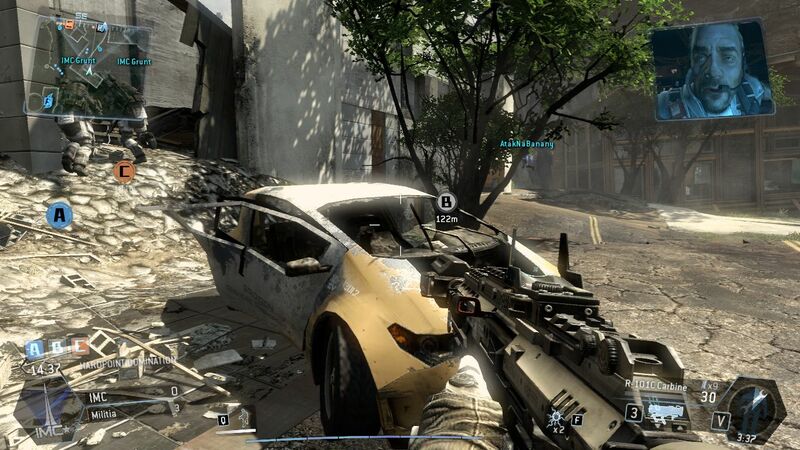 Since the frame rates often dropped by one-third or more in scenes that were heavy on effects (explosions, smoke, etc. ), the average rate should be at least 30-35 fps. 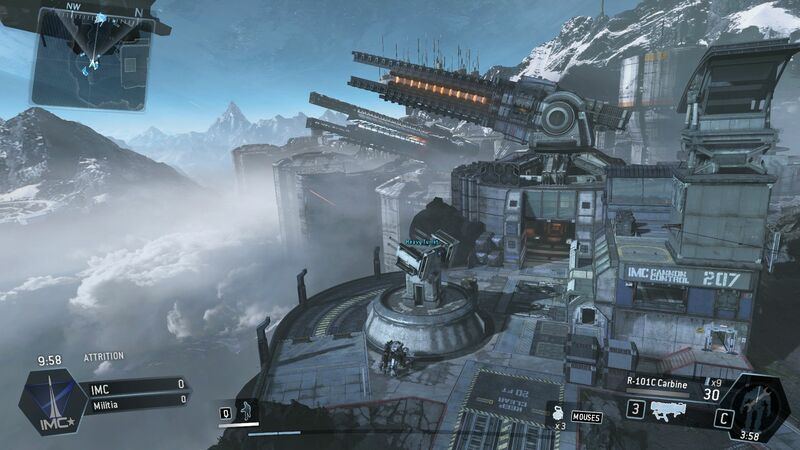 If the score is lower, Titanfall jerks too much in some levels/passages. 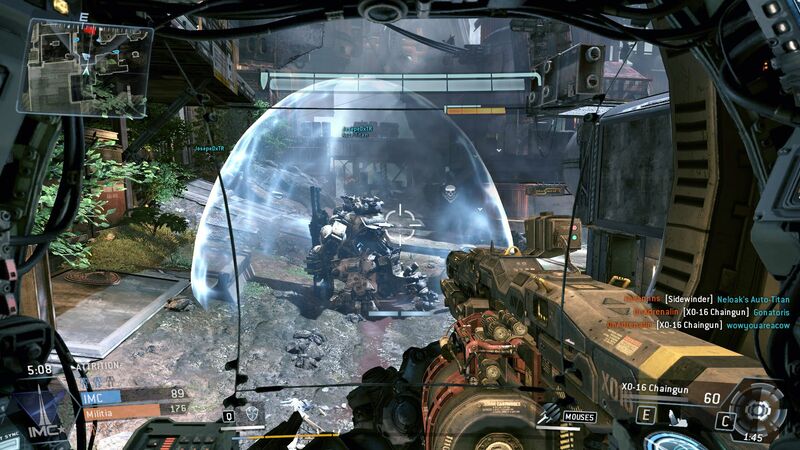 How hardware-hungry is Titanfall? The game actually proves to be quite frugal. 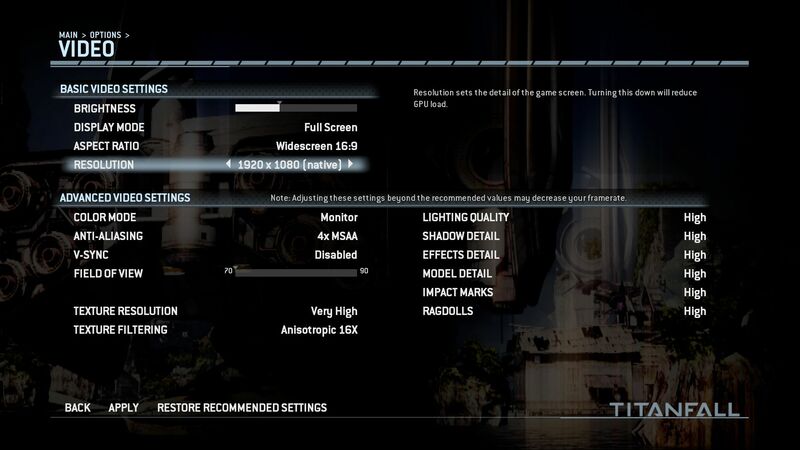 If you want to play the action title at 1920x1080 pixels, very high details and 4x MSAA, you will have to have a high-end GPU installed in your computer, but a GeForce GTX 765M already climbs over the 35 fps line. For high graphics settings, 1366x768 pixels and 2x anti-aliasing, you will need at least a card from the upper middle class (ex. the GeForce GT 750M). Typical all-round GPUs, like the GeForce GT 740M, can still run the game at normal settings if the AA option is deactivated. Entry-level chips on the level of the Intel HD Graphics 4600, however, can only handle low resolution and details. The GeForce GTX 860M's relatively bad score (Ultra, see table) can probably be explained by the driver. While the notebooks we have on long-term loan run with the absolute most current driver Nvidia recommends (ForceWare 335.23), the XMG P304 had to make do with the somewhat older version 332.35 in our review. Hence: To keep your card at its maximum performance, be sure to update your driver. The driver is also important for the Intel HD Graphics 4000, which only functioned properly with the brand new beta version 10.18.10.3496 ("properly," that is, if you overlook the lousy performance). The official but now somewhat antiquated driver, version 10.18.10.3412, produced massive graphics errors. 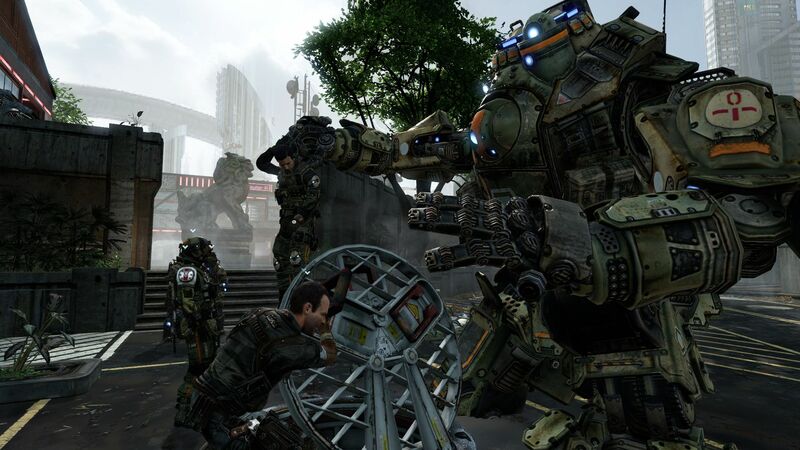 Considering the fps limits, the huge file size and the large time commitment, Titanfall certainly will not become part of our "standard parkour." Best not expect too many benchmarks to come for this title. The 64-bit edition of Windows 7 is installed on each of these devices. A further thank you goes to Micron for the 480 GB Crucial M500. We have also included benchmarks from other notebooks (perhaps with different drivers).